Anyone else feel like 2014 is just starting? Not sure where the first 2 months of the year have gone? Or are you acutely aware of where they’ve gone, because it feels like you’re catering to everyone else’s needs, priorities and crises … at the expense of your time, energy and resources?? 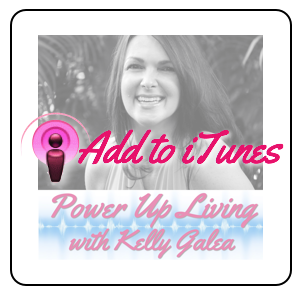 Then you’ll want to tune in for this episode of Power Up Living with host Kelly Galea. She’s had her own share of energy-draining situations the last several months which left her feeling run down, frustrated, and irritated — many times, anything but “powered up.” She’ll share the ways she recaptured and maintained a positive charge, turning around more than a few stress-inducing situations in a short time. + Relaunch radio show, websites, etc. While Kelly loves learning something new every day and appreciates the Universe’s sense of humor, she just wasn’t quite getting it! In fact, she was feeling like there must be a hidden camera somewhere recording this comedy of errors, chaos and dysfunction. The absurdity of it all made her want to laugh AND cry! 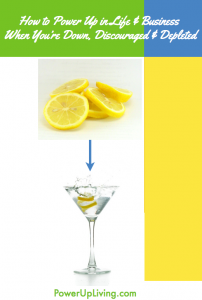 Join Kelly as she shares how she made lemonade (and lemontinis) out of life’s lemons. She’s grateful for this show and audience as part of her life lesson is to share those lessons and help bring you a sense of peace and calm in this crazy world.